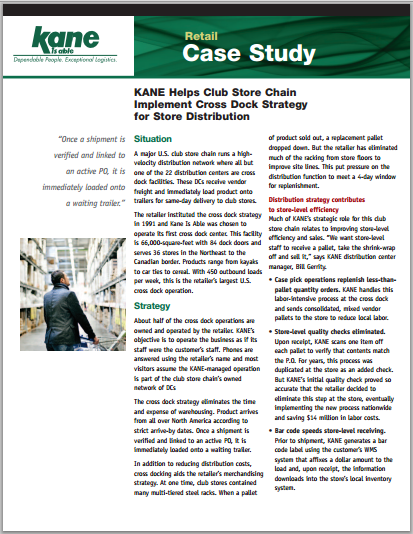 In 1990, KANE developed a cross-docking solution for a major club retailer to receive product from vendors, make it “store-ready” through consolidation and deliver it to stores − all within 24 hours. The solution leveraged KANE’s transportation management service and effectively eliminated storage costs. By delivering excellent results, KANE has been given the opportunity, over the years, to assume the operation of three additional cross-dock facilities for this major chain.